Information returns (generally Forms 1099, 1095 and W-2) must now be mailed to payees by January 31, 2017. The due dates for submitting to the authorities vary. Please refer to the table below. Because of the potential penalties for incorrect information, we strongly suggest that information returns be mailed to payees as soon as possible with an enclosed request for the recipient to contact you if there are any changes to be made. All income tax returns now ask if you have properly filed all 1099s. As such, it is more important than ever to consider whether you should file Forms 1099. Generally, if you are receiving this letter, you probably have a filing requirement. You should refer to IRS package 1099, “2016 General Instructions for Certain Information Returns”, for detailed filing requirements that depend on types of payments to report. A penalty for failure to file Form 1099 could be from $260 to $530 per return, with no maximum penalty. Employers with 50 or more full-time equivalent employees must file Forms 1095-C and 1094-C annually to report information regarding health insurance they offered to employees. Regardless of size, all employers that provide self-insured health coverage to their employees must file Forms 1095-B and 1094-B annually to report coverage information. See the above chart for the due dates. You should refer to the IRS instructions for the respective forms to determine which forms you are required to file. The penalty for failure to comply is $260 per employee, up to the maximum penalty of $3,193,000. Therefore, it is imperative that procedures be established to comply with these provisions. Forms W-2, 1099 and 1095, among others, must be electronically filed when 250 or more documents are filed per return type. If fewer than 250 information returns are being filed, the payer may file the paper copies along with transmittal forms (IRS Form 1096) to the appropriate taxing authorities. Electronic filing may be used even if you file fewer than 250 returns. You may also furnish Forms W-2 to employees electronically if disclosure requirements are met. It is not necessary to file information returns with the Franchise Tax Board if paper copies of these same returns were filed with the IRS. However, if you file your information returns electronically, you are required either to file with the FTB or obtain IRS approval to file using the Combined Filing Program; making it necessary to file solely with the IRS. You should refer to IRS Publication 1220 for specifications for filing electronically. You should also refer to IRS Publication 15-A, Employers Supplemental Tax Guide, or the instructions for forms such as a W-2 for more details. The authorities are strongly challenging companies’ treatment of employees as independent contractors. To better understand whether a person is an employee or a contractor, please refer to Publication 15-A. If the authorities suspect that your company has misclassified an employee as a contractor, the employer may become liable for both employer and employee portions of payroll taxes not withheld, as well as penalties and interest. We highly suggest examining and documenting your relationship with your independent contractors in order to avoid potential audits. Any business that is required to file a 1099-MISC for services received from an independent contractor is required to report specific information to the Employment Development Department (EDD). You must report the independent contractor to the EDD within 20 days of either making payments totaling $600 or more or entering into a contract with an independent contractor for $600 or more, whichever is earlier, using DE 542 (Report of Independent Contractor(s)). Reports do not have to be filed if the contractor is a corporation. The penalties for failure to comply can be quite substantial. Therefore, it is essential that procedures be established to comply with these provisions. The employer rate will remain unchanged at 6.2%; however, the Social Security base wage will be $127,200 for 2017. The base Medicare tax rate of 1.45% that is imposed on employee wages remains unchanged for 2017. The Additional Medicare Tax of 0.9% levied on high-income earners ($250,000 if married filing jointly and $200,000 if filing single) remains unchanged. For withholding tax purposes, covered wages in excess of $200,000 will be taxed at a rate of 2.35% (1.45% + 0.9%), regardless of filing status. Employers are not subject to the additional tax. Employees should be informed that they may be subject to the Additional Medicare Tax on individual tax returns if the high-income AGI thresholds are met, even though it may not have been withheld. Please contact us if you would like more information. The net FUTA tax rate for 2017 is expected to be at 2.7% (6.0% base rate – 3.3% federal credit for state tax paid) of the first $7,000 of taxable wages for each employee. The federal credit will be reduced by 0.3% each year until California has repaid certain federal loan obligations, unless waived. Please refer to the Form 940 Schedule A instructions prior to filing. The EDD requires employers to report wages and withholdings quarterly. Employers need to report and file a quarterly Report of Wages and Contribution Return (Forms DE9 & DE9C). Registered employers should automatically receive the forms by mail. The Affordable Care Act requires employers to report the cost of coverage under an employer-sponsored group health plan on Form W-2. The value of health care coverage will be reported in Box 12 on the Form, with Code “DD” to identify the amount. There is no reporting on the Form W-3 of the total of these amounts. Until further guidance from the IRS, reporting is optional for employers who are required to file fewer than 250 Forms W-2 for the preceding calendar year. Specifically with S corporations, the authorities will be strictly enforcing the reporting of medical insurance premiums paid for shareholders owning 2% or more of the company. The premiums are required to be included as compensation, not subject to Social Security, Medicare, or Unemployment taxes, on Form W-2 for each applicable shareholder. Withholding of income tax is required on any wages paid to employees. Wages include, but are not limited to, any cash or non-cash payments of salaries, fees, bonuses, commissions and fringe benefits. The types of cash and non-cash wages or fringe benefits should be reviewed periodically to determine if they are includable as wages and if so, whether they are subject to income tax or FICA tax withholding. You must deposit income tax withheld, Social Security, Medicare, and backup withholding taxes with an authorized financial institution or Federal Reserve Bank in accordance with rules that depend on the amount of your tax liability. There are two federal deposit schedules, monthly and semi-weekly. You must determine which of the two deposit schedules is required before the beginning of each calendar year. Federal Unemployment Taxes are generally deposited quarterly. To determine your payment schedule, refer to Publication 15. California taxes are generally due when federal taxes are due. Federal employment taxes must be deposited by electronic funds transfer using the Electronic Federal Tax Payment System (EFTPS). 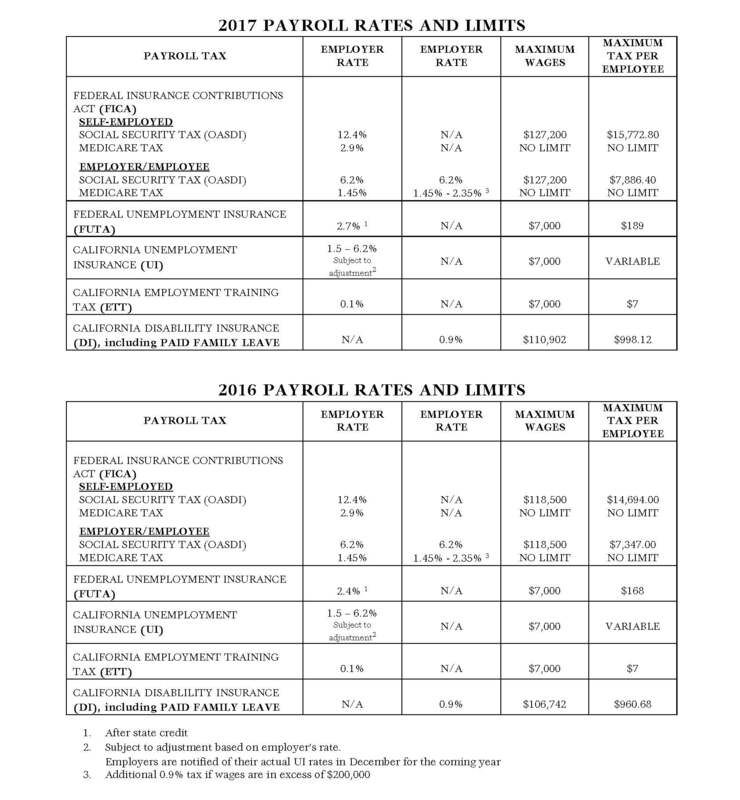 California employment taxes must be remitted by electronic funds transfer if their total averaged $20,000 or more during the prior state fiscal year (July 1 to June 30). The federal government notifies you prior to your required payment. California will notify you by letter dated October 31, prior to the year of participation. If the total accumulated federal tax reaches $100,000 or more on any day during a deposit period, it must be deposited by the next banking day. Employers who are subject to the federal “$100,000 Next-Day Deposit Rule” must also deposit state taxes by the close of the next banking day. Both the IRS and State of California have substantial penalties and rigid collection policies with regard to late or underpaid payroll taxes. Therefore, it is essential that you institute policies within your organization to ensure timely deposits of payroll taxes. You must verify that each new employee hired is legally eligible to work in the United States. This includes completing the US Citizenship and Immigration Services Form I-9. Newly hired employees must complete Section 1 on Form I-9 no later than the first day of employment. Employers must complete Section 2 within three business days of the date employment begins. Employers who fail to properly complete, retain, and/or make available for inspection Form I-9 as required by law, may face substantial civil penalties. The State of California has established the New Employee Registry. Employers have 20 days to report the newly hired or rehired employees to the EDD on Form DE34. Employers who reimburse an employee’s expenses often assume that the reimbursement will not be income to the employee. But, that is only true if the reimbursement is made under a qualified Accountable Plan. An Accountable Plan must state that 1) expenses have a business connection, 2) expenses must be substantiated, and 3) any excess reimbursement be refunded to the employer. If the requirements are not met, the amounts must be included in the employee’s gross income, subject to payroll taxes, on Form W-2.